Of course there was some very pleasurable eating involved as well – what’s new there then ! And we had some great encounters with people we met along the way. We stayed at the Sonesta – our home from home – again. As I always say to be greeted like old friends is lovely and the staff there never fail to make us feel special and valued. 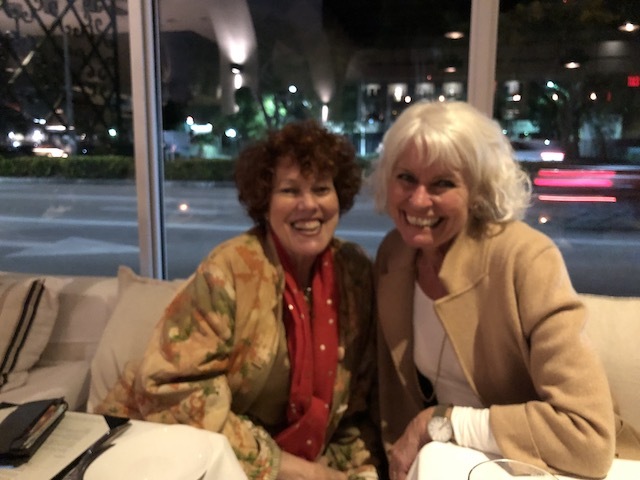 We flew in this time with Silver Airways and it went without a hitch – picked up a car at the airport and headed straight to One Door East for a lovely meal. 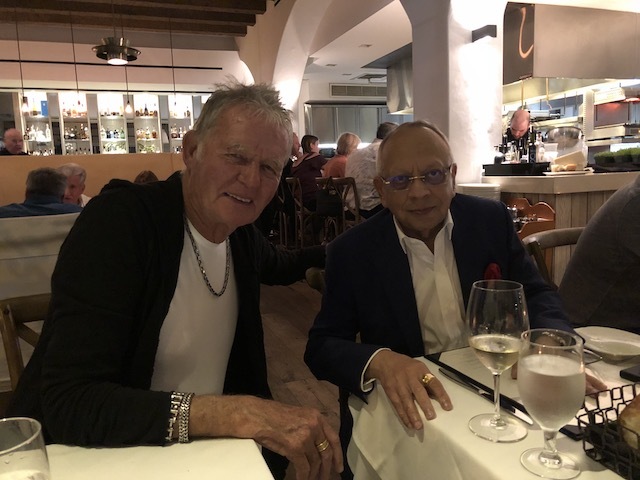 After a good night’s sleep we headed off to Palm Beach where I get my hair cut and felt human again …. Don’t you agree that a good haircut gives you a real boost – well it does me anyway ! Shopping in the afternoon then an early dinner at Valentino Cucina. The meal was superb but we had a lovely encounter with two people sitting next to us. 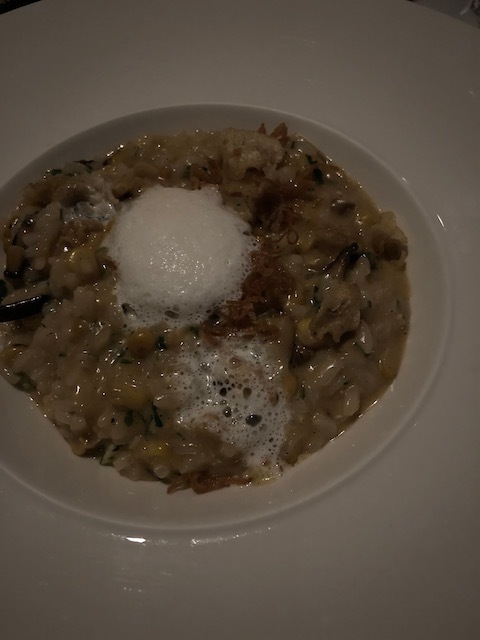 This was my appetizer – a fantastic risotto with mushrooms, caramelized onions and a delicious foam on top which I couldn’t tell you what it was if my life depended on it !! 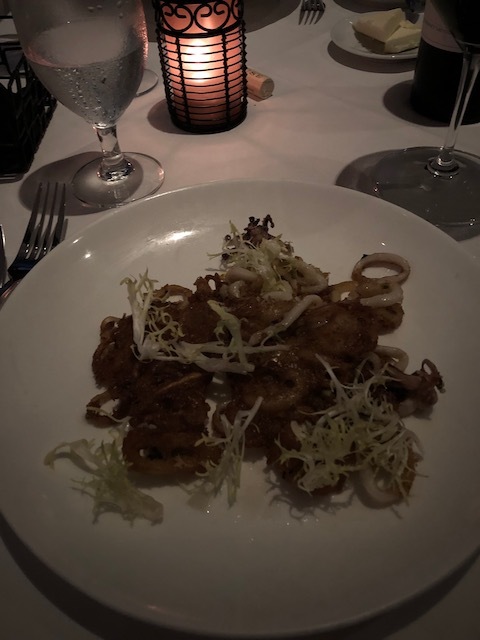 Bob’s appetizer of calamari – oh so good ….. The seating in the restaurant has a banquette along 2 sides of the space and the tables are pretty close together. These 2 people came and sat beside us and immediately we said good evening and the fun took off from there on in ! Jacqueline said how nice it was to be dining with us and her companion immediately struck up a conversation with Bob. He was a small Indian man – from New York it turned out – and our conversations were fun and wide ranging. 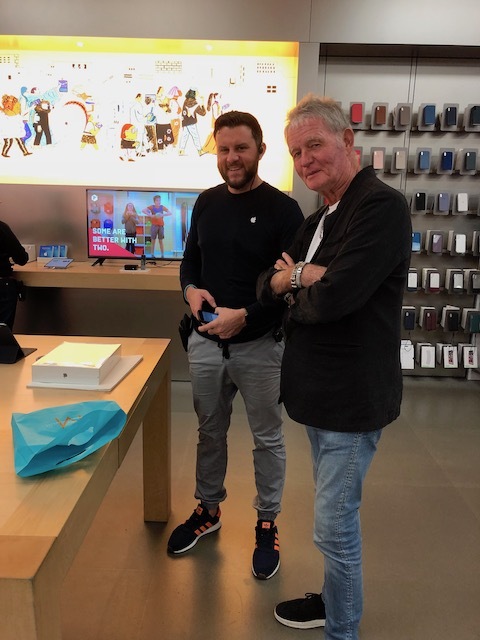 No visit to Florida is complete to us without a trip to – no not Ikea this time – the Apple Store, and this time we had 2 visits ! First Bob needed a new laptop so we bought that on Saturday then I needed to have the technical staff do their magic for me on my laptop. Scarily the system had to be wiped then re-installed with me doing the back up bit when I got home on Monday. With the help of our own Apple guru Singe – who lives in Hong Kong !! – I finally got back on line with everything back in place. Technology is a wonderful thing – but it is terrifying when you don’t actually really understand it ! 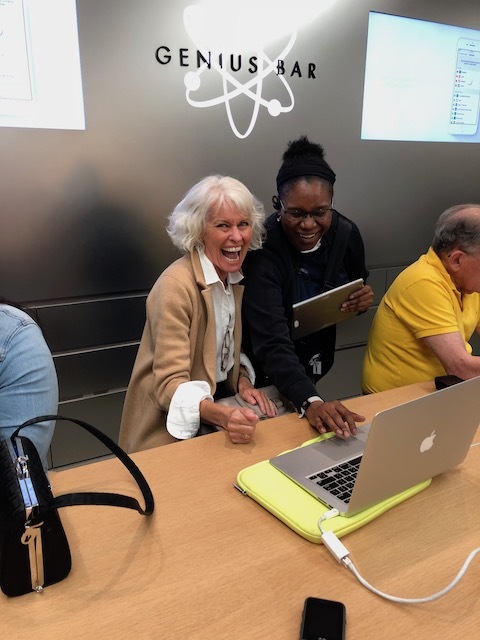 A touch of relief hysteria with the brilliant Apple Genius Georgia – all sorted ! Anyway all is well now and once we have the crucial dongle – don’t ask if you don’t know ! – over here we will be able to get Bob’s new baby set up. The Sunday we were there was Super Bowl Sunday – did you know that lots of restaurants do not open that day as everywhere is so quiet ? No – nor did we until we tried to go to Siam House – the Thai restaurant we love. They were closed as was Thai Spice another one recommended to us but eventually of course we did manage to find somewhere and ate well before going back to the hotel for Bob to watch the game. 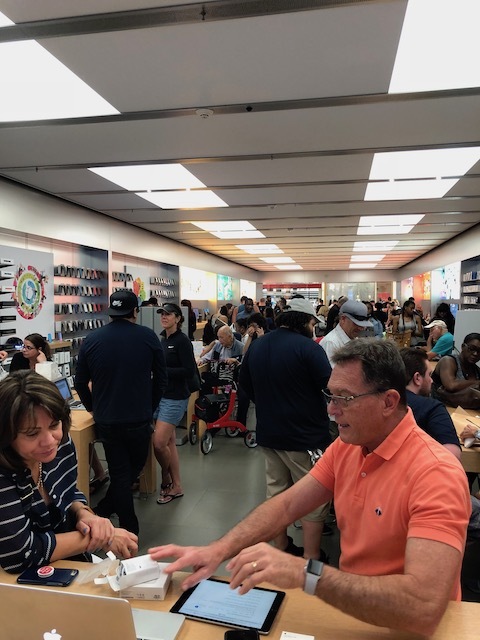 This was the Apple store in Fort Lauderdale late on Sunday afternoon – they should all be at home having Super Bowl parties …. It was a short trip but we got plenty done and really enjoyed ourselves and as I always say – how lovely it is to come home and know that you live in the right place…..
Bob felt this was the best way to bring back a skimmer basket for one of the pools ! In Fort Lauderdale airport …. Hello, thanks for the updates… we were wondering if you knew anything about the Potlatch project stopping? 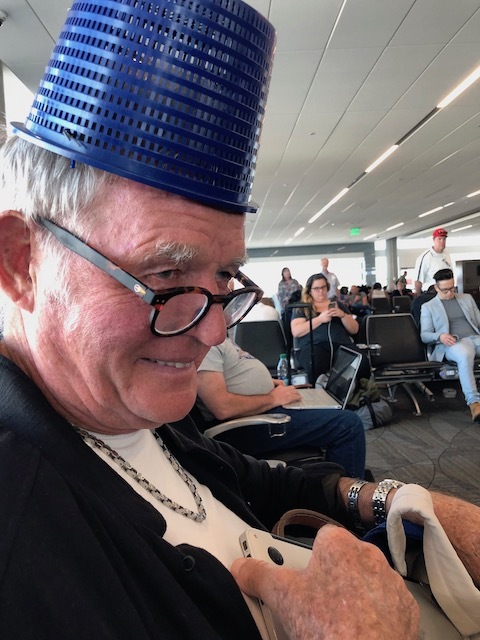 Not too sure – but just temporary I think…..
Bob’s fashion choice is cracking me up! i love it :) it opens up a whole world of possibilities. the food looks divine and your haircut is just lovely! i agree, there is nothing like a new haircut. as always, thanks for sharing and we are looking forward to being back in governor’s harbour soon! Thanks so much for sharing your trip! Sounds like good living. Potlatch project? Maybe just a pause? Yes – a small pause – stuff is going on again !